Over the years, we have amassed a vast collection of archive cine-film from a variety of owners. Quite a lot has been used in our volumes but there is still considerable footage that remains unused because it either did not fit in with our volumes or we were not aware of the locations. Much of this film is now over half a century old and it is a shame to think that so much of it could end up being either thrown away and lost forever, unseen. To help solve this we are making this series of “Miscellanies” using most of this previously unseen footage and assembled in the order it runs off the cine reel without our usual detailed commentary. 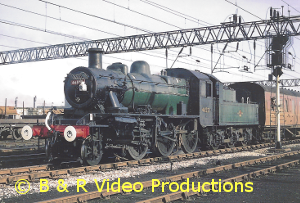 This volume is the second in our miscellany series to cover London Midland steam and it mostly features previously unseen colour film. The only black & white content is a brief look in the late 1940s at the last days of the LMS in Leicester and on the Lickey Incline. 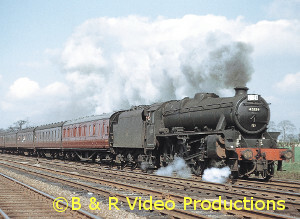 During May 1964 there is still plenty of LM steam to be found at Derby including a Royal Scot normally allocated to Carlisle. The steeply graded Lickey Incline at Bromsgrove was always a favourite with enthusiasts, and we feature 9F 2-10-0 No.92079 plus a host of 0-6-0 assistants helping trains up the hill. A route not often covered is that from Nuneaton to Leicester and this is seen around Elmesthorpe and Burbage Common in 1963 & 1964. A number of visits are made to Crewe and we see a variety of Coronation Pacifics, including the last ever pre-preservation departure in September 1964. Plus two different types of double chimney Black 5s and a host of other classes all bustling around this busy major railway junction. We stay a while at Rose Grove shed, and then time is spent around Chinley and Buxton watching steam labouring up the grades of the Peak District. After a short visit to Beattock with its bankers, an enjoyable time is had on Shap Bank watching and listening to steam doing battle with the grades over the bleak moorlands. There is much coverage around Manchester and Stockport while other areas visited include Preston, Lostock Hall Shed, Leeds, Carnforth, Shrewsbury, Stoke-on-Trent, Lancaster, Giggleswick and Settle. The archive film is in both colour and Black & White and was mostly filmed between 1960 and 1965. An authentic sound track has been added along with a commentary to complement this nostalgic look at the last years of London Midland steam. Cover photo:- Keith Pirt/Courtesy Book Law Publications, Ivatt 2-6-0 No.46520 at Crewe in March 1967. We originally put this volume together over 10 years ago but after we received much more North Western film we abandoned its release and instead made the 10 volume series “Along LMS Lines”. However the demand for LMS steam scenes seems insatiable and so we have decided to release this volume as the first of a new series. Some sequences appear in “Along LMS Lines” but we are sure you will enjoy this volume in its own right! More “London Midland Steam Miscellanies” will follow using previously unseen material. We begin at Preston with plenty of steam action around the station area, including the engine shed, and then head north. After passing through the 1939 closed station at Barton & Broughton there is a visit the signal box. Brock station also closed in 1939 but there were water troughs nearby. Here, 45531 is making an impressive display dousing its train! Then on to Garstang & Catterall where the local pick-up goods is shunting the yard, and onwards to arrive at Lancaster. The route of the Midland Railway’s pioneering electrification to both Morcambe and Heysham is covered and includes one of the very last times a steam hauled breakdown train was called out. There is also a journey along the “Little North Western” route from Settle Junction to Lancaster. We return to the West Coast Main Line and visit Hest Bank and Bolton-le-Sands, before finally arriving at Carnforth. This last bastion of steam is covered in detail and we witness the comings and goings plus the daily routines of a working steam depot before it ceased forever. 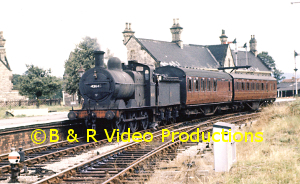 All the archive film is in colour and mostly from the last few years of steam traction on these routes. An authentic soundtrack has been added along with an extensively researched commentary. Cover photo:- Keith Pirt/Courtesy Book Law Publications, 9F No.92016 on a empty coaching stock train near Preston, 1963.